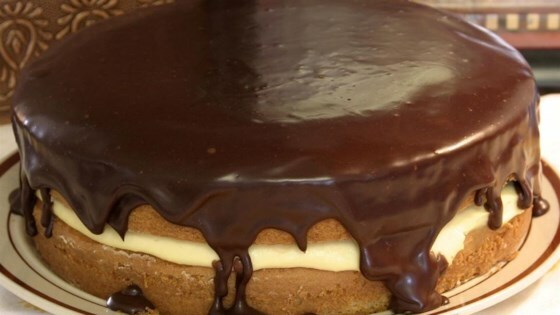 "This is my quick and easy version of Boston's Parker House Hotel's famous cake." Spray 2 (8-inch) cake pans with cooking spray. Stir yellow cake mix, 3 eggs, water, and vegetable oil in a bowl until moistened. Beat with an electric mixer on medium speed for 2 minutes, scraping bowl occasionally. Divide cake batter between the two prepared cake pans. Bake in the preheated oven until cakes have risen and are lightly golden brown, 33 to 38 minutes. Check for doneness after 25 minutes. A toothpick inserted into the center of the cakes should come out clean. Allow cakes to cool for about 10 minutes before removing from the pans. Cool cakes completely, about 40 minutes. Whisk 3 eggs, cornstarch, and sugar in a large bowl until well mixed and lemon colored, 2 to 3 minutes. Set aside. Heat 1 cup heavy whipping cream, whole milk, and 1/2 tablespoon butter in a large saucepan over medium heat until it just begins to boil. Reduce heat to low; pour egg mixture into cream mixture and whisk until thick, about 1 minute. Pour egg and cream mixture through a fine mesh strainer into a large bowl; discard any chunks. Whisk vanilla and salt into the egg and cream mixture until combined. Cover with a layer of plastic wrap pressed against the surface. Chill in refrigerator to form a pastry cream texture, 3 to 4 hours. Place chocolate in a large bowl. Heat 1 teaspoon butter and 1/2 cup heavy whipping cream in a saucepan over medium heat until butter is melted. Pour cream mixture over chocolate and whisk until smooth. Set aside until cooled, but still pourable, about 20 minutes. Place one cake layer on a plate, flat side up. Spread pastry cream to within 1-inch of the edge of cake. Place second cake layer on top, rounded side up. Press gently to push pastry cream to the edge. Pour chocolate mixture over top of the cake and spread so it drips over the edge. See how to make a wicked-good chocolate and vanilla-cream dessert. Excellent! The pastry cream took approximately 8 minutes to thicken up and I had to turn the heat up higher, and keep stirring. We were not disappointed.